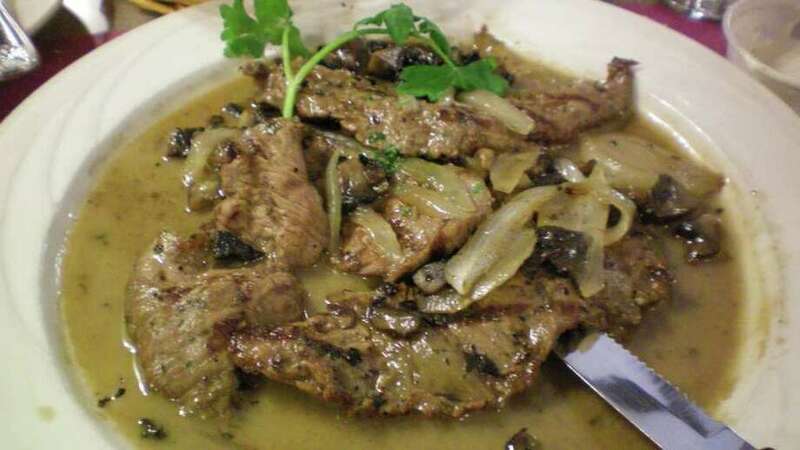 Tasty and affordable: London broil with portobello mushrooms, onions, balsamic vinegar in a lemon wine sauce at Pizza Palace on Black Rock Turnpike in Fairfield. I think the most expensive meal I ever had (or at least the priciest meal that I paid for), was at Aureole in New York City. It was the vegetarian tasting dinner, complete with matched wines, for something like $185. Per person. It was a special occasion -- my sister-in-law's birthday -- and she wanted to see what a grand New York restaurant experience was like. You know what I remember about that meal? Not much. On the other hand, I can't seem to get the $8 Shish Tawook sandwich out of my head that I had at Safita a few weeks ago. It just goes to show you, money doesn't necessarily bring culinary satisfaction. Then recently, my editor was telling me about the filet of sole he had at Pizza Palace on Black Rock Turnpike in Fairfield. What? Filet of sole at a pizza joint? Yes, indeed, and it came with a salad, bread and potato. And it was less than $15. I told my husband we were going to be celebrating a romantic Valentine's dinner at Pizza Palace, with one caveat: He had to order something non-traditional off the menu. "I don't think so," he said. Well, you can lead a horse to water, but you can't make him eat leg of lamb, right? In any case, I was up for the challenge to see if I could order something a bit more extravagant than baked ziti or a tuna melt off of the extensive menu. I was buzzing with anticipation. Would my gamble pay off? The first difficulty I encountered was steering myself away from the club sandwiches and chicken souvlaki listed on the huge menu. As a food writer, I experience all types of wonderful cuisine, but I'm hardly a food snob. In fact, I love diner food. I wrested myself away from the Burger Corner and the Pastrami 5 Star and moved on over to the seafood page. There was Grilled Swordfish Ala Gorgonzola or Shrimp and Scallop Stir-fry in a teriyaki sauce. Shrimp & Broccoli Scampi sounded great, but just not right for this experiment. I finally settled on the Broiled Stuffed Trout with Seafood Stuffing ($15.95). "How's the trout tonight?" I asked the waitress. She paused. Not a good sign. "The what?" she asked. I pointed to the menu. "We don't have that tonight. Certain things, like trout and red snapper, they're not in season, so we don't have them," she said. I suppose that's a good thing, alluding to the fact that perhaps they only serve fresh seafood. Back to square one. I settled on one of the nightly specials: London Broil with Portobello mushrooms, onions, balsamic vinegar and a lemon butter wine sauce ($14.95). This came with soup (yankee bean, matzoh ball or minestrone) or salad. I picked the salad with a Caesar dressing. For sides, I had a choice of mashed or baked potato and a vegetable: spinach, carrots, broccoli, asparagus or mixed veggies. I chose mashed and carrots. My husband got as wild as he could and ordered a clams casino pizza ($12.45). And then there was my son (because nothing says "romantic Valentine's dinner" more than toting along a 4-year-old an hour past his bedtime). As much as I love food, Henri can't be bothered with it. Unless it's yogurt or fruit, he has no interest. The children's menu had grilled cheese, chicken fingers, hamburgers, spaghetti ... none of which he will touch. I finally talked him into a side of meatballs ($3.50), which five minutes later turned into the desire for pepperoni pizza. Fortunately, the chef was able to scatter a few pieces of pepperoni onto the pizza before it made it into the oven. And, oh, the wine. From the wine list in the plastic picture frame on the table, I chose a half carafe of merlot ($14.95). Now it was time to evaluate our surroundings. This is definitely not a pizza joint with vinyl floors and red-checked tablecloths. In fact, for a restaurant with "Pizza" in its name, it's quite nice. There were fresh flowers on every table and the ubiquitous shakers of Parmesan cheese and red pepper flakes were on a small wall shelf. The clientele was a mix of couples (remember, Valentine's Day) and families with young kids. There were people eating pasta, people eating pizza. I saw an antipasto platter go by that looked pretty decent, and "The Super Sampler" (chicken tenders, buffalo wings, mozzarella sticks and potato skins), which appeased the group of tweens at the next table. A big basket of bread came out first, and I was quite pleased (and admittedly, surprised) that it was: a) warm; b) crusty on the outside, soft on the inside, and c) served with real butter, not margarine. The salad surprised me, too. Yes, it was iceberg lettuce (which, let me state for the record, is fine. I love all sorts of greens and iceberg has its place in this world. It's crunchy, refreshing and sometimes baby field greens just aren't what you're after). There were shredded carrots, thinly sliced green peppers, cucumbers, tomatoes, red onions and olives. The dressing came in a plastic container on the side. Okay, not fancy, but better than having a big glop dumped on top. Our meals arrived as I took the last bite of salad. Henri took one microscopic bite of a meatball and declared it "saucy." My husband's pizza was big enough to give one piece to Henri (yes, he ate most of it) and still have leftovers. And then my dinner. A large plate held thinly sliced London broil that had been grilled and sauced. The mushrooms were cut into bite-sized pieces and the onions were sliced just thick enough to have a little texture and not fade away into obscurity. It was very tasty, as were the sides. The mashed potatoes were fabulous, which no doubt means they were loaded with cream and butter, and the carrots were fresh. Not from a can, not frozen. Fresh. The bill came to $50 and change. It was only after we left that we realized we had been overcharged by about $3 for the wine. So, in the end, if we hadn't ordered the uneaten meatballs and had been charged the correct price for the wine, we would've been looking at about $44. Not too shabby. But the story doesn't end there. I wondered how we would've fared if we ordered similar meals at higher-end restaurants. If, for example, we went to Old Post Tavern in downtown Fairfield and I ordered an iceberg wedge ($8), the skirt steak ($24 with mashed potatoes), and a side of vegetables ($5), my meal alone would be $37. The most comparable thing to the clams casino pizza would be a small order of linguine with white clam sauce ($12), and the items on the kids' menu are $8, coming to a grand total of $57, before wine. Winner? Pizza Palace. Just for fun, let's compare a couple of Westport restaurants, too. At Rizzuto's, an Italian house salad ($6), Angus sirloin with vegetable and potato ($28), a North Beach pizza (clams and pancetta, $16), a side of meatballs ($5), and a bottle of their least expensive red wine ($32) equals $87. That's a $43 difference. Best bargain: Pizza Palace. And lastly, Tavern on Main, that venerable spot in downtown Westport. Garden Market Salad ($9), New York Strip Steak with onion rings and spinach timbale ($30), clams casino appetizer ($12), a granola bar found in the bottom of my bag for Henri (free, since they don't have a kids' menu or anything comparable to a side of meatballs), and four glasses of their least expensive red wine ($36) also comes to a grand total of $87. The clear value: Pizza Palace. In the end, of course, there are other factors to consider. First, I'm comparing cuts that come from different sections of beef. Sirloin steak is certainly going to cost more than London broil, which is typically made from a tougher round cut. However, that London broil at Pizza Palace was darn tasty. Second, the addition of wine is a huge factor. This is where Pizza Palace loses some of its points. If they sold a half carafe of wine for, say, $9, they'd still make a profit and probably sell a lot more. Lastly, and this is the crux of the matter, is ambience. If you're looking for a trendy, flashy scene or a romantic, candlelit corner, you're going to pay for it. If, however, you're looking to have a pleasant, satisfying dinner, at a place where you can bring your kids (or not), check out Pizza Palace. Just don't get your heart set on the red snapper. Closed Mondays; Tuesday-Thursday, 11:30 a.m.-11:30 p.m.; Friday and Saturday, 11:30 a.m.-1:30 a.m.; Sunday, 11:30 a.m.-9 p.m. Lunch, Monday-Friday, 11:30 a.m.-2:30 p.m.; Dinner, Monday and Tuesday, 5-9:30 p.m.; Wednesday, 5-10 p.m.; Thursday, 5-10:30 p.m.; Friday, 5-11 p.m.; Satursdays, lunch from 11:30 a.m.-4 p.m., dinner from 4-11 p.m.; Sunday, lunch from 11:30 a.m.-4 p.m., dinner from 4-9:30 p.m.